Shop Our Online Store to Get Started Right Away! 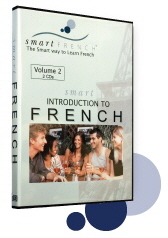 This is Volume 1 of two volumes introducing the French language to the total beginner. In this first volume, you will work on the alphabet, the numbers and the verb conjugations that we noticed are the most used in spoken French. You will have a gentle and progressive approach to very common verbs and their most used tenses. You will practice "to be", "to have", "to go" and "to do" with multiple examples, making you speak the way the French really speak. You will practice by repeating and filling the blanks. .
Ready to proceed with Vol.2 ? This is the second volume of this introduction to French. You will learn basic vocabulary and grammar progressively and naturally with multiple examples, repeating, filling the blanks and speaking like the French speak. With these Audio CDs you will work on natural conversations with our unique Active Sensory Comprehension method. You will learn your new language both effectively and efficiently. You will develop your listening skills. For reference, we give you a booklet with the transcripts and the translations, with our color coding system to help you pronounce the words and sentences the way you will hear them pronounced in real life conversations. This step by step approach to the language will help you understand French, like no other method, early in your studies. After mastering the dialogs at the Beginner level, you will practice at a different pace at the intermediate level and even faster at the Advanced level. This is to slowly train you to grab more and more of the conversations at real speed. You can use these CDs in your car, on the subway, etc... The more you practice, the better you will be. In addition to the CDs Beginner and Intermediate/Advanced, you might want to consider purchasing the CDROM. Besides the lessons that you will find on the CDs Beginner and Intermediate/Advanced, this CDROM includes videos of the conversations. It's very useful and more fun. The CDROM is also interactive. You can choose the dialog you want to start with, clicking on the photo of one of our guests, all very interesting people, a diplomat, a fashion model, an art editor, a singer, a student, etc... You can choose to follow our steps or do your way. You can watch the video or just listen to the dialog, check on the French transcript or read the translation. As it is a progressive method, it's better to follow directions first. Then, exclusively on this CDROM, you have an "Extras" section with more excerpts of the same conversations used in the lessons, some casual dialogs you will find interesting like a conversation in a cafe, in the street, at a museum, etc... The CDs and the CDROM make a good combination. 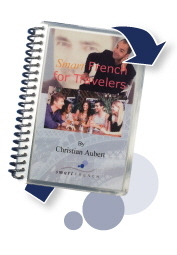 If what you need is just to practice a few sentences before your next trip to France and bring with you a wonderful tool, here is a great all laminated book that is coiled bound to make it easy to leave it opened at the page that corresponds to the situation you are in. Our color-coding system is used to help you pronounce the sentences casually. The English sentence is on top with the French underneath. The sentences are classified in 17 situations, like at the "restaurant", in a "cafe", at the "airport", etc... All sentences are affirmations or questions that you may hear or want to say or ask. They are individually numbered, (should you choose to download the free sound files included with your purchase) for your mp3 player, iphone or ipod. 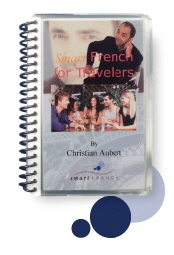 Here is the sound of the SmartFrench For Travelers Book. For each sentence, you hear the English, then the French at slow speed so you learn how to pronounce it precisely, and finally the French line at real speed for you to learn how to say it naturally and effortlessly. When you are in a cafe in Paris, just listen to the sentence you select by its number and say it exactly the way it is supposed to be said and have fun. If you choose to not purchase the wonderful book, we included the PDF version here.